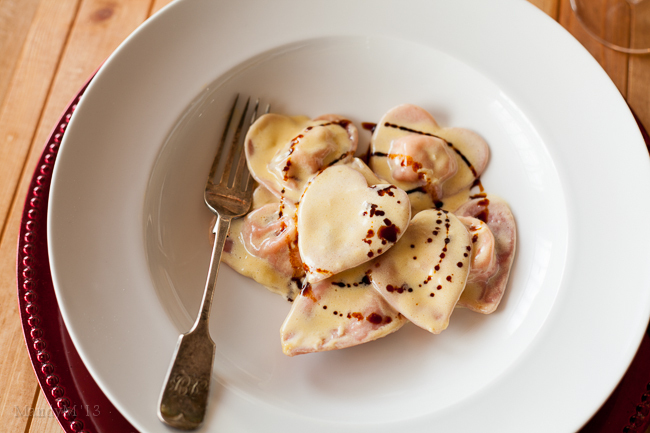 Ravioli with White Wine Cream Sauce — What the Fruitcake?! I don't write poetry or have any sentimental attachment to cards given no matter the occasion. I'm not particularly fond of cheap fluffy toys or heart shaped boxes of chocolate given on Valentine's. But, I am a romantic. I love the idea of getting a vibrant bouquet of flowers delivered at work. I like little gestures that say I was being thought of, even if it's a token like a new book by a favourite author or something silly like my favourite box of "naughty" cereal appearing on a Saturday. Some might not think those are particularly romantic gestures, but they make me smile and feel special, and I think that's what romance is all about. In return, I might sneak hubby's favourite chocolate into the weekly shop or deliver his coffee with a kiss and a cuddle. Sometimes it'll be an unsuspecting back scratch that makes hubby break out in goosebumps, a simple text message or randomly shouting out "LOVE YOU!" while pottering around the house. So what does all this mushy gushy stuff have to do with this recipe? It's simple. One of my favourite ways to say "I love you" is with something I've cooked up in the kitchen. This particular meal was inspired by the culmination of many, many, MANY visits to the Italian School of Cooking in Dublin. If you follow me on Facebook you may have seen the photos from some of those classes. If you've seen those photos, you'll understand why I keep going back. It's just so much fun! I've always loved Italian food, but Giuseppe and Isabella have made it more than just food. Having fun in their classes, I've realised that Italian food is actually very similar to Greek food, which I grew up with. It's more than just a meal. It's all about sharing the meal with friends and family while chatting and laughing. It's the experience. I've also learnt how darn easy it is to make! All sorts of people come to the classes. Kitchen nuts like me, boyfriends who never step into the kitchen other than to raid the fridge for leftovers, moms, sisters, aunts, grandfathers, brothers. Those who know what a spoonula is, those who think it's some sort of exotic ingredient. No matter what their skill level in the kitchen, they all walk out beaming after hand making their own pizza or pasta dough, from scratch. One of the things I've learnt to make is ravioli. I won't give away their recipes for ravioli, you'll just have to sign up for a lesson yourself (and if you're not lucky enough to be in Ireland, I'm sorry! ), but with a few bits of advice from Giuseppe I came up with my own recipe that's simple and tasty. I also like to think there's a nonna out there with the exact same recipe, proving my honourary Italian title has been earned. Back to romance, I thought I'd have a little fun and get a somewhat cheesy with my ravioli. 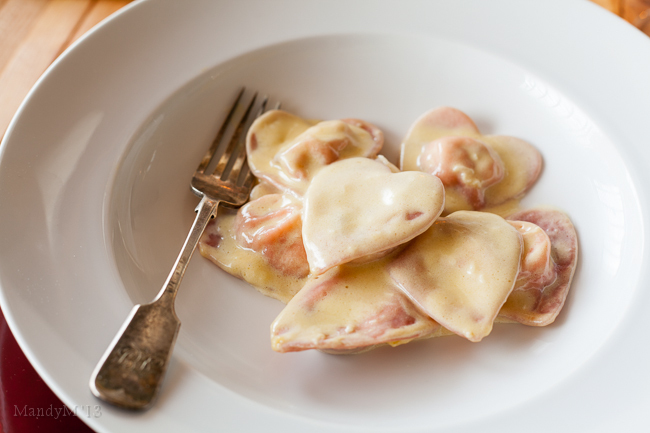 One times heart cookie cutter, one times ball of beetroot dyed pasta dough, and you get pink heart ravioli! Yeah I know, a little twee, but they turned out great and made hubby smile. Inside each heart, sweet ricotta and tangy marinated sundried tomatoes with a hint of parmesan and fresh basil. I asked Giuseppe what he'd recommend for a sauce. I said I didn't want a tomato based sauce and was wondering if a cream one would be fine. (See, there are some rules when it comes to the marriage between pasta and sauce, for eg. chicken and pasta just doesn't happen, regardless of what's on offer in restaurants). I was hoping he would say a cream sauce would work, especially because I wanted to make a white wine cream sauce, and he assured me that it would be great. Giuseppe was right. The combination was just amazing. 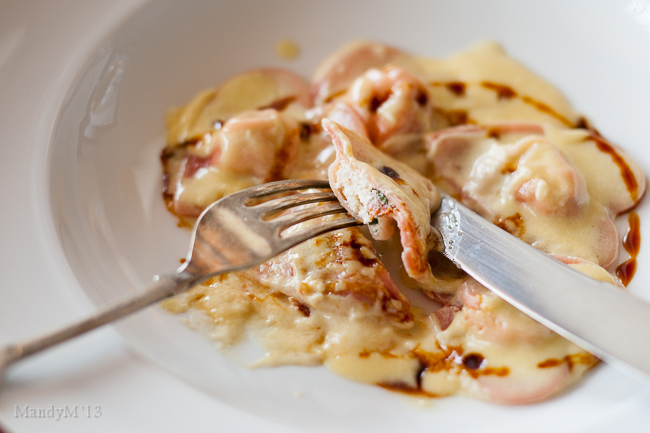 A sweet yet earthy ravioli coated in a rich wine infused cream sauce, simply put, delicious. Valentine's or not, treat your special half (and yourself!) to this gorgeous meal and eat your heart out! Tip: Pasta dough starts to dry out very quickly, so to avoid your pasta being too dry to stick the two strips together, only work with 2 strips at a time, unless you've got helpers and you can form a pasta making conveyer belt! 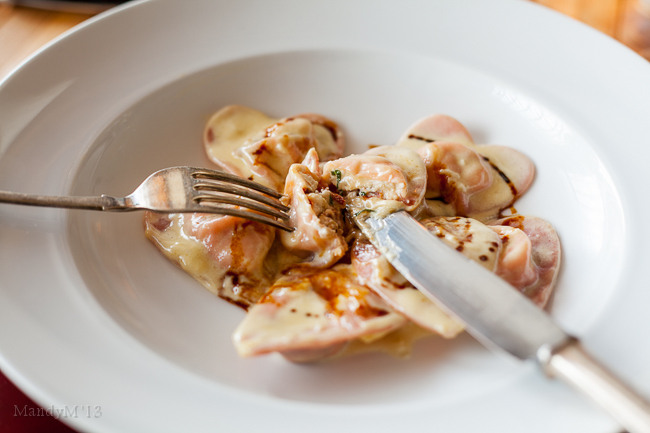 Once ravioli is cooked, use a slotted spoon to scoop 2 - 3 ravioli out of the water at a time, tapping on the edge of the pot to drain as much of the water as possible, and gently drop the cooked ravioli straight into the cream sauce. You can choose to use all flour, all semolina or any mixed ratio of the 2. The semolina gives the pasta a firmer cooked texture, more of a "bite". This is down to personal preference. You can freeze any leftover uncooked ravioli and boil it from frozen when needed. Simply arrange the uncooked ravioli on a floured tray and put the tray in the freezer for about an hour or until the ravioli is firm. Then remove the tray from the freezer and place the ravioli in airtight bags or containers. You will have leftover pasta dough from the recipe above. 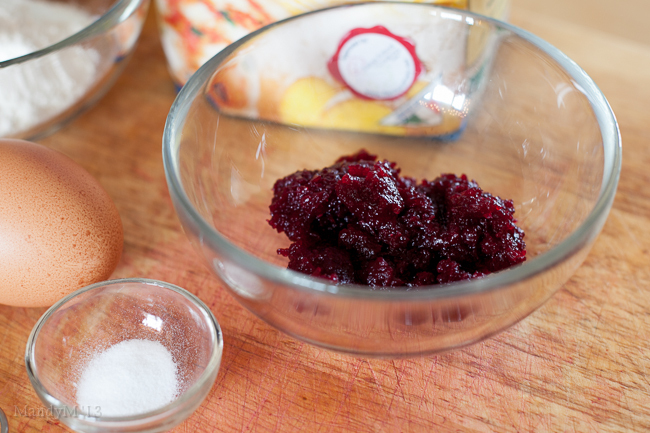 If you don't want red/pink pasta dough, then simply leave out the pureéd beetroot and half the flours and olive oil, but still using 1 egg. This will give you half the amount of pasta dough. However, seeing as you're making pasta dough, make the full amount and make other pasta with the excess dough. I used my KitchenAid pasta extruder to make spaghetti and maccheroni. You could also use your pasta machine to make linguine etc. Cooking is far more organic than baking, so the amount of seasoning is up to your own tastes. Use my recipe as a guideline, but taste everything along the way to see if you're happy with the flavour. 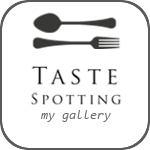 Posted on February 4, 2013 by Mandy Mortimer and filed under Savoury and tagged Cooked Cream Italian Pasta Ricotta Savoury Sundried Tomato Valentine's White Wine.